Women’s Survey: Who’s Playing the Game? 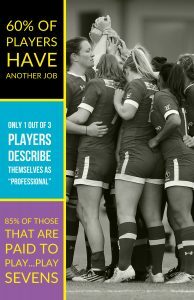 Along with calls for clarity on the future of the Women’s 15s game, today’s Global Women’s Survey gives us an insight into the type of player that’s competing at the elite level. The profile of the Women’s rugby player is young, with 44% of players aged between 18 and 23 years old and just 16% of players 30 or over. The majority of players (70%) started playing rugby in their teenage years and players were generally introduced to the sport by friends, in university or through high school initiatives. Approximately a third of all respondents consider themselves to be a “professional” with 35% describing themselves as “semi-professional”. The remainder (31%) consider themselves as amateur athletes. 42% of players say they can live off their income from Rugby although this standard of living is categorised as “surviving” rather than living. 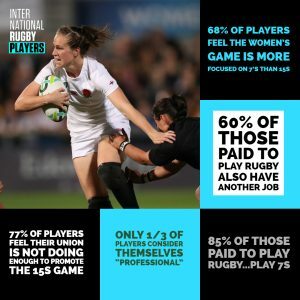 60% of those receiving income from their participation in rugby are also supplementing their income with another job while just over one-third of the players are students, the majority of these (70%) in the 18 to 23-year-old age bracket. One of the stand-out findings from the survey is that 68% of players felt that the Women’s game globally is more focused on Rugby Sevens rather than the traditional 15s version of the game. From a participation perspective, over half of the athletes playing women’s rugby (52%) play both codes while 21% are 7’s specialists and 27% are 15’s specialist players. Notably, 85% of those receiving any pay for playing Rugby are participating in the 7’s version of the game. Of the specialist 15’s players, only 15% are receiving any income from the sport. 75% of players in the 15s code feel there is not enough games for their country. Interestingly, the remaining 25% are from the European region who have the benefit of the 6 Nations competition. 77% of players globally feel that their union is not doing enough to promote the 15’s game. Overall, there is a real fear for the future of the 15’s game among players, as the extended funding models available for Sevens means that is where the high-performance investment is going, while some nations are also utilising the same players to ‘top-up’ their 15’s programmes, particularly in World Cup year. From a load point of view, 56% of players on the series struggled or sometimes struggled to keep up with the playing and training requirements involved while 59% said they struggled or sometime struggled with the mental fatigue associated with participating on the circuit. Training load seems to be the real issues, due to the irregular timings of tournaments where players are under-trained or even over-training in order to fulfill contractual/funding requirements. Factors affecting mental load include the stress of satisfying employment requirements while committing to their respective national programme. Annual leave is used for training and tournaments, meaning players don’t get the break they need to mentally recover.